Fig.1: Some of team members and workers of the 2017 season at Gird-i Bazar. 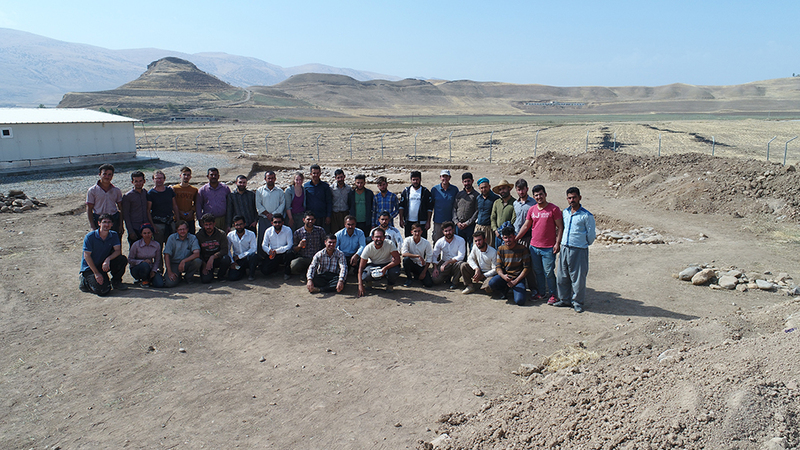 And 20 workmen from Qaladze and the village of Nureddin. 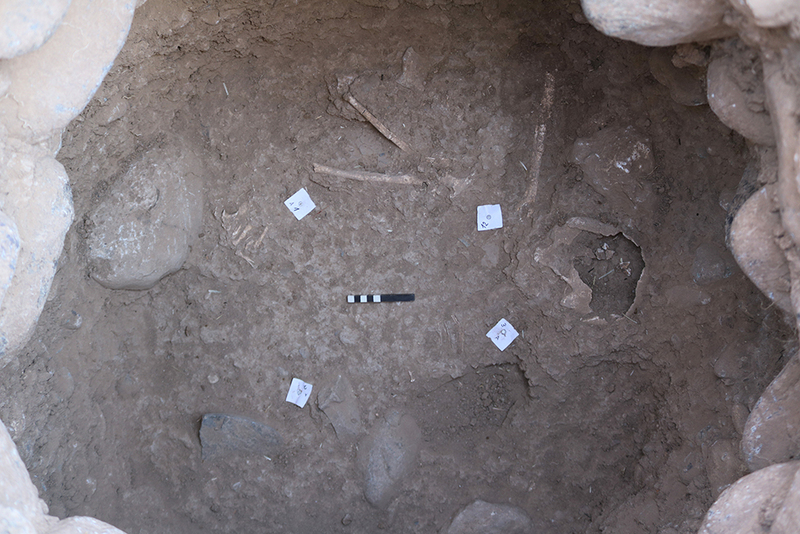 During the 2017 excavation campaign at Gird-i Bazar, the area north of the chicken farm enclosure was completely excavated. Including the 2015 and the 2016 campaigns, the total area unearthed at Gird-i Bazar now amounts to 1164 m2. Fig. 2: Combined orthophotos showing the areas excavated in 2015, 2016 and 2017. 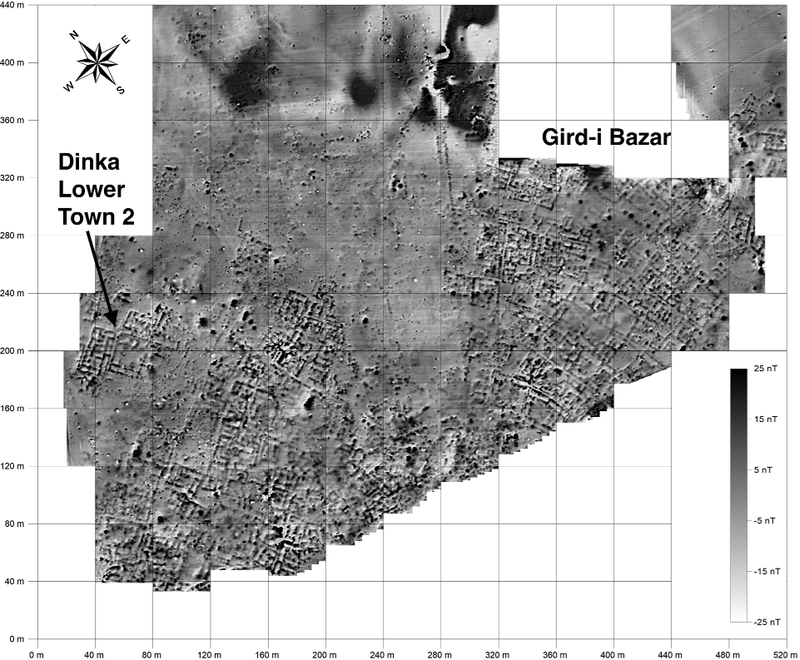 These three excavation campaigns have allowed us to obtain a clear picture of the spatial organization and function of the structures unearthed at Gird-i Bazar, located on the north-western edge of the Dinka Lower Town. 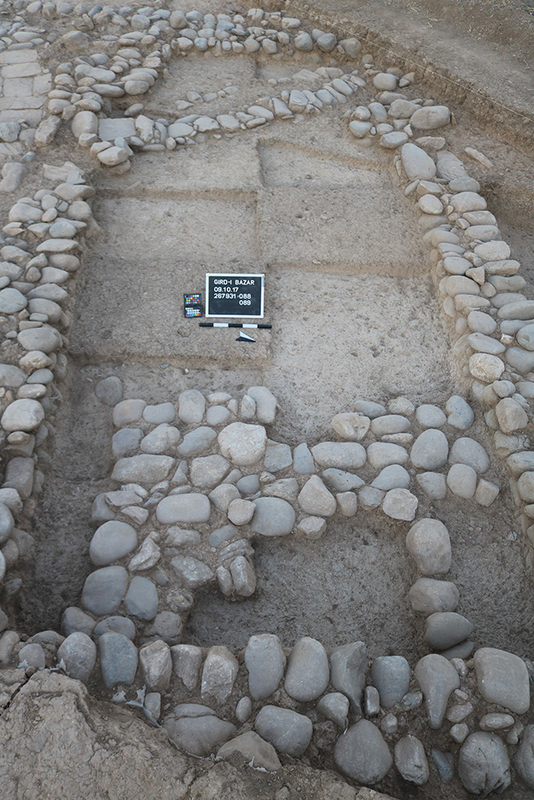 The excavations have revealed alleys separating building complexes consisting of several rooms grouped around courtyards. A striking pattern is that each of the building complexes features one large room in which few or no installations were found and in which pottery and other finds are very rare. Specifically, this refers to Room 3 in Building Complex A/B, Room 19 in Building Complex E/D, Room 17 in Building Complex H/I and Room 15 in Building F. These rooms were likely used as living and reception rooms; they could be accessed from the alleys and were often connected to courtyards. In the immediate vicinity of these rooms, there are installations necessary for daily life such as wells and bread ovens, as in the courtyard of Building F.
Fig. 3: Room 46, where a potter’s slow-wheel pivot and large amounts of pottery were retrieved. Around these large rooms, smaller rooms are present, which can be interpreted as production areas and workshops according to the findings and installations found therein, as in Rooms 18 and 46. The discovery of a potter’s wheel pivot in Room 46 seems to indicate that this area functioned as a pottery workshop (fig. 3). 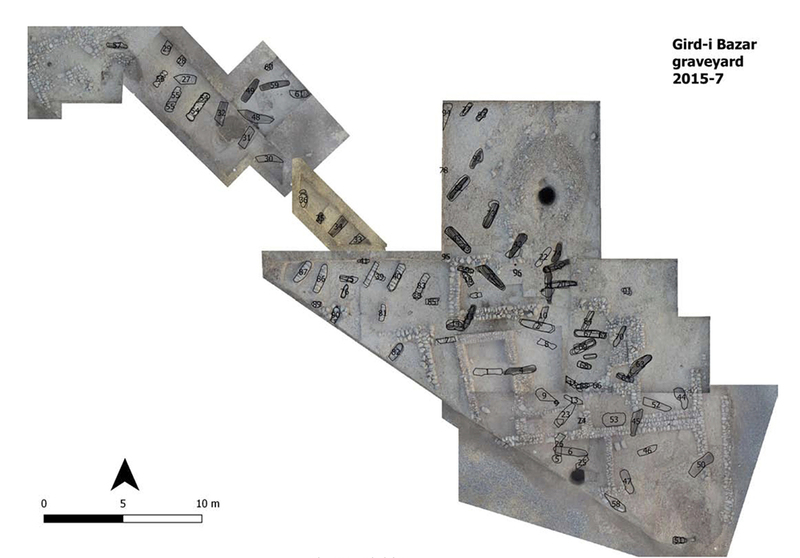 The presence of working areas is further evidenced by the excavations of three kilns for pottery production, two in Outdoor Area 8 and one in “Room 31” of Building D (fig. 4). One kiln in Outdoor Area was discovered in 2015 and fully excavated in 2016 (Amicone 2017). 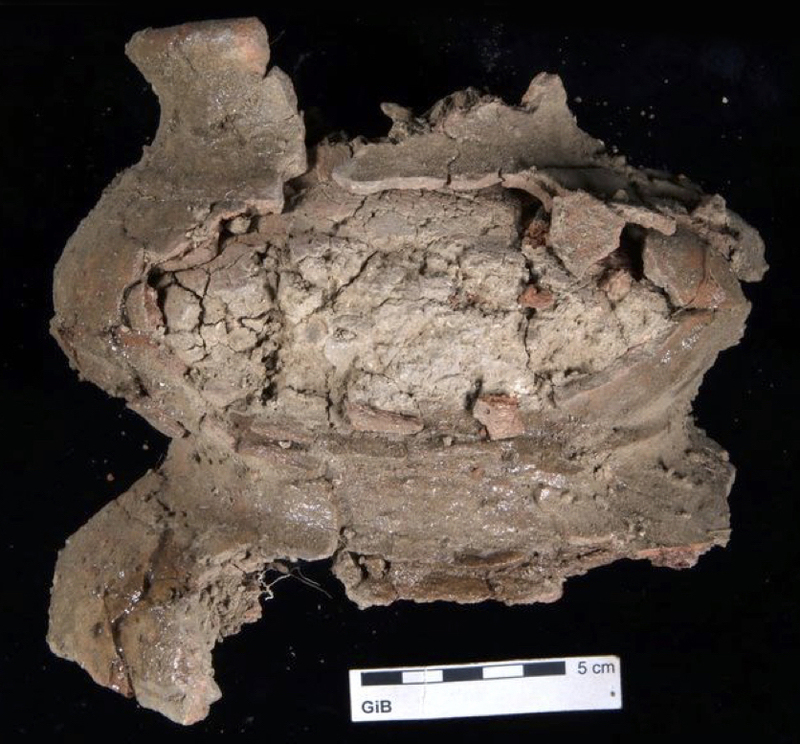 Interestingly, the three kilns show differences in structure and in the formation processes of their fills, which may be indicative of different purposes (used for different types of ceramics?) and different abandonment processes. In addition, two different types of furnaces were found this season, pointing to other types of production activity. The discovery of some iron slags may be connected to this. Fig. 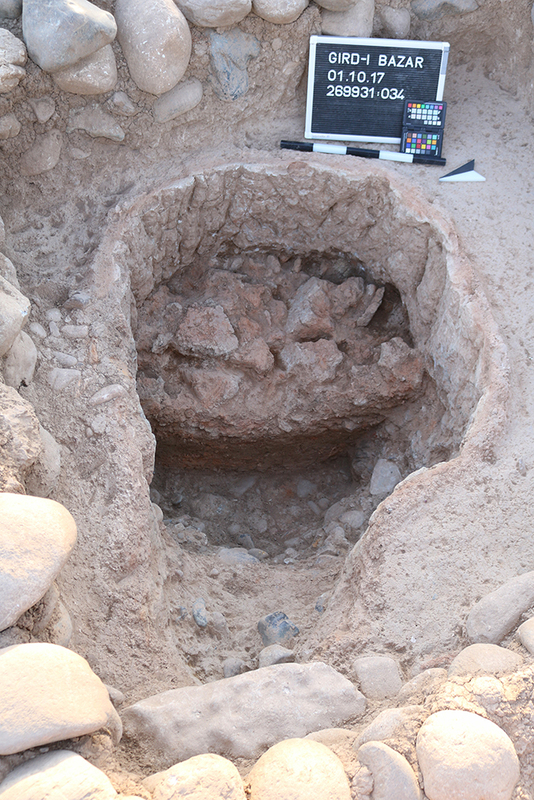 4: The pottery kiln in Room 31 Building D.
In Outdoor Area 7, north of Building B, a very large well, about 7 m deep was found but not yet fully excavated (fig. 5). It is much wider in diameter and deeper than the wells excavated in Building F Courtyard 21 (excavated in 2016) and Building I Room 49 (excavated this season). This large well may have been part of an intensive water management setup, possibly connected to the Bora Plain qanat system presently under investigation in the area east of Gird-i Bazar (Altaweel 2017). Fig. 5: The large well in Outdoor Area 7. An intriguing and unexpected discovery are the three disarticulated skeletons found in the well of Building I Room 49 (Grave 71) at a depth of around 1.5 m (fig. 6). Provisionally, anthropologist Kathleen Downey (Ohio State University) identified these as an elderly woman, a stillborn child (possibly with a bone malformation), and a young woman (so far only partially unearthed). The excavation of the well will be continued. Fig. 6: Partially uncovered skeletons in the well of Room 49 in Building I (Grave 71). The excavation of the Sasanian-period cemetery of Gird-i Bazar (Greenfield 2017) continued under the supervision of Kathleen Downey. So far, around 90 graves have been identified, of which more than 50 have been excavated, resulting in the recovery of c. 60 bodies. The graveyard contains adults, young adults and children. Only some of the graves yielded grave goods, mostly jewelry with parallels from other Sasanian-period sites in Iran and the U.A.E. Recurrent patterns in spatial distribution and funerary rituals are beginning to emerge (fig. 7). Fig. 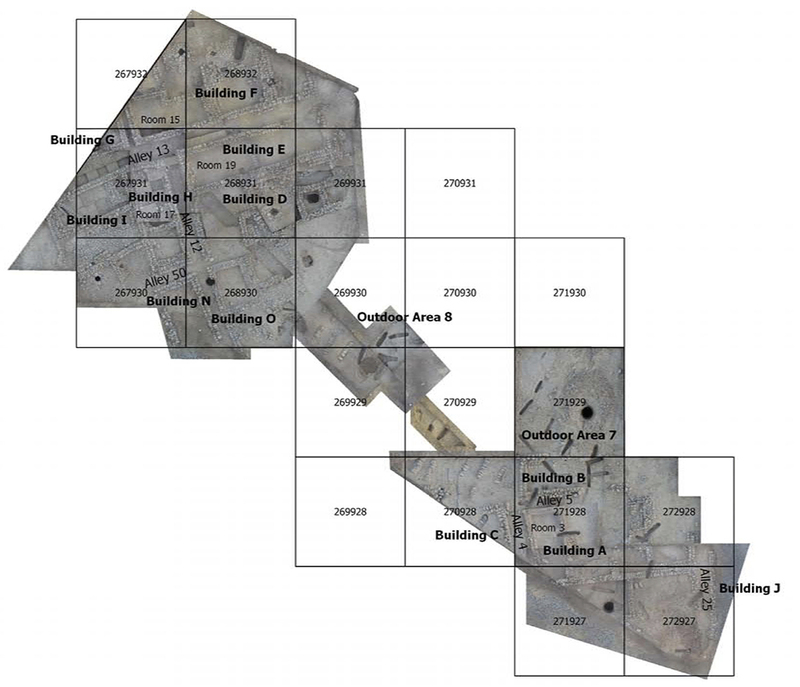 7: Plan of the Sasanian period graveyard, 2015-7. The striking results of the 2016 magnetometer survey (Fassbinder et al. 2017) showed that the structures unearthed at Gird-i Bazar are in fact part of a larger settlement, called Dinka Settlement Complex, extending across the Bora Plain, between Gird-i Bazar and the impressive mound of Qalat-i Dinka to the west. The prospection was continued (fig. 8). To the north of Gird-i Bazar no structures became visible, indicating that Gird-i Bazar’s location is at the northernmost limit of the settled area. No traces of any fortification or enclosure wall were detected. Fig. 8: 2016-2017 combined magnetogram of the Dinka Settlement Complex. By Jörg Fassbinder, Andrei Ašandulesei and Marion Scheiblecker. Around 500 kg of pottery – considerably more than in previous campaigns – were collected during this season from the floors and fills. Fig. 9: Figure-of-eight profile jar. The 2017 pottery from Gird-i Bazar confirms the typological and technological groupings created on the basis of the 2015 and 2016 pottery (Herr 2017). There are, however, some new finds that expand the repertoire attested at Gird-i Bazar, including a jar with a figure-of-eight profile (fig. 9) and an incurved rim bowl with impressed fingernail decoration (fig. 10). 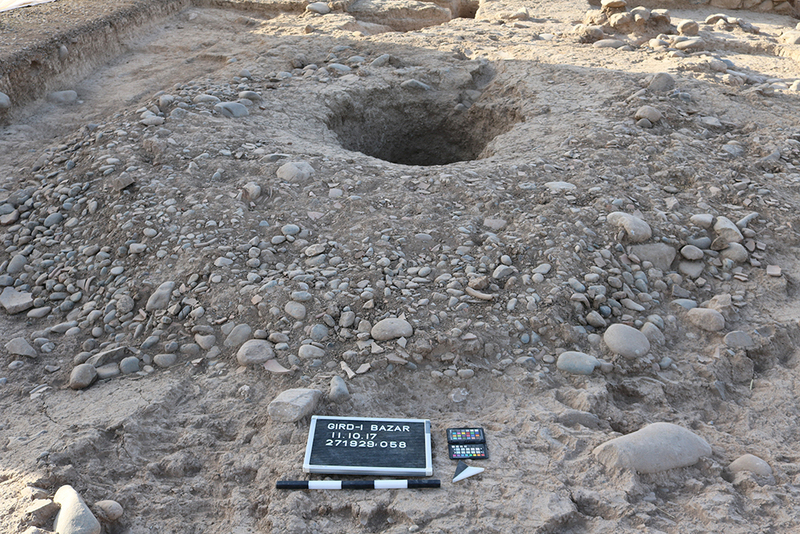 Interestingly, around 130 kg of pottery were found in one context only, namely in the lowest excavated levels of the 7 m deep well in Outdoor Area 7. Despite its fragmentary state, the pottery recovered from this well shows the highest level of preservation so far attested at Gird-i Bazar, since the pottery unearthed so far has for the most part been broken into very small sherds. Fig. 10: Rim sherd with impressed fingernail decoration. 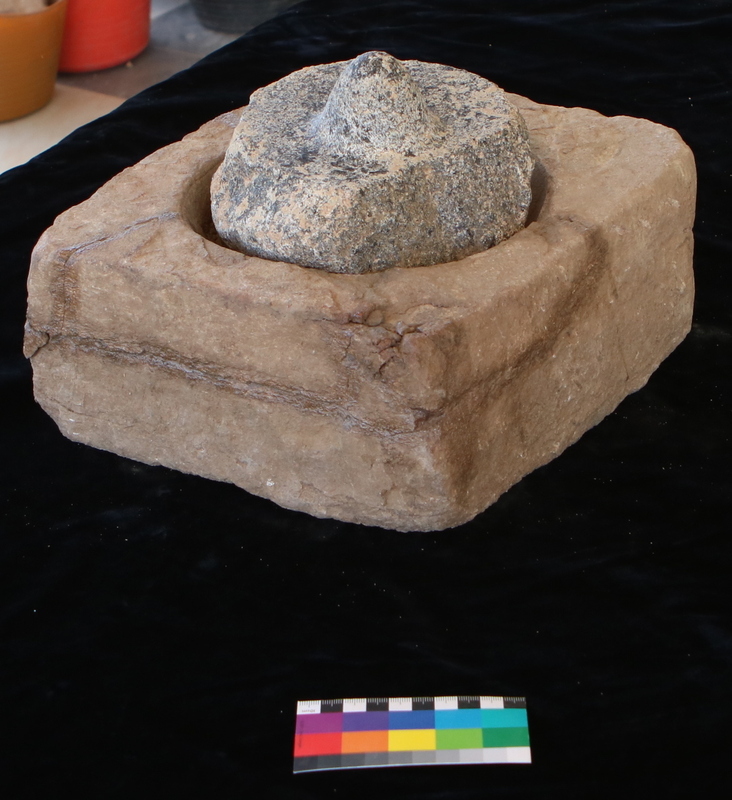 The small finds of this season continue the trends observed in 2015 and 2016 (Squitieri 2017), with portable stone tools (pounders, weights, polishers and pebble mortars) constituting the majority of finds. It is likely that these tools were mostly involved in pottery production processes, for instance to crush minerals and plant material used as temper. The large square stone bowl and the pivot of a potter’s slow-wheel (fig. 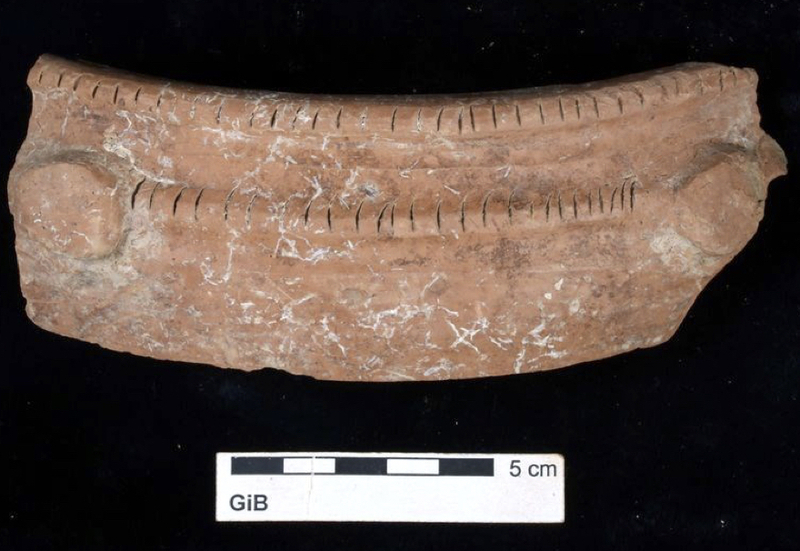 11) discovered in Building I Room 46 add more evidence for the manufacture of slow-wheel produced pottery at Gird-i Bazar, as had already been assumed on the basis of the technological study of the pottery (Herr 2017). Fig. 11: Our reconstruction of the slow wheel mechanism found in Building I Room 46, with the square bowl used as a base in which the slow wheel pivot was inserted. In conclusion, the 2017 season allowed us to complete the architectural assessment of the remains of Gird-i Bazar with the chicken farm enclosure. It seems to have hosted buildings and areas for living and working, with workshops for pottery and perhaps also metal production. Housing was well supplied with water due to the presence of wells in all houses and in outside areas.